High acid foods are processed in a boiling-water canner. The heat is transferred to the product by the boiling water which completely surrounds the jar and two-piece cap. A temperature of 100° C (212° F) is reached and it must be maintained for the time specified. Always follow a modern recipe with proven and tested processing times. This method is adequate to kill molds, yeasts, enzymes and some bacteria. This method never reaches the super-high temperatures needed to kill certain bacterial spores and their toxins, which can produce botulism, therefore, this method cannot be used for processing low-acid foods. See more about the Basic Steps for this method, or learn more about pressure canning and low acid foods. Water bath canners are widely available. You can use any big pot, however, if it is deep enough for the water to cover the tops of jars by several inches. Allow 5 to 10cm (2 to 4 inches) above jar tops for brisk boiling. The canner must have a tight-fitting lid and a wire or wooden rack. The jars must be held off the bottom so the heat can penetrate properly. The jars are divided so they will not bump into each other or tip over in the boiling water during processing. To ensure uniform processing of all jars with an electric range, the canner should be no more than four inches wider in diameter than the element on which it is heated. However for flat top stoves, canners should be*no more than 2 inches wider than the diameter of the element. What Foods Use This Method? Acid foods like fruit butters and spreads, fruit pie fillings, sauerkraut, pickles and pickled vegetables, jams, jellies and marmalades can be safely processed by boiling water bath canning. The types of organisms that cause spoilage in these foods are usually killed at boiling temperatures. Use the boiling water bath method for canning acid foods. Because the hybrid varieties of modern tomatoes are on the borderline between being acid and low-acid, tomatoes and tomato products are no longer considered safe for water bath canning methods without additional acidification. 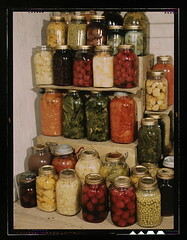 Pressure canning is the only canning method recommended for low-acid foods like meat, poultry, seafood and vegetables. Clostridium botulinum, the bacterium that causes botulism food poisoning, is destroyed in low-acid foods when they are processed at the correct time and temperature in pressure canners. Canning low acid foods in boiling-water canners is absolutely unsafe because the botulinum bacteria can survive this process. If Clostridium botulinum bacteria survive and grow inside a sealed jar of food, they can produce a deadly toxin. Just a tiny taste of food containing this toxin can be fatal. Put filled glass jars into canner of hot or boiling water. For jams, preserves and raw packed fruits or tomatoes, have water in canner hot but not boiling. For pickles and hot packed fruits and tomatoes, have water boiling. Add boiling water until it is an inch or two over tops of containers; don't pour boiling water directly on glass jars. Place cover on the canner. *See more about the Basic Steps. For most foods, you start to count processing time when water in the canner comes to a rolling boil. Processing methods for some pickles, such as fresh-pack dill pickles, are slightly different from the usual water_bath procedures. For these products, start to count the processing time as soon as you place the filled jars in the actively boiling water. Follow instructions carefully for the food you are canning. Keep water boiling gently and steadily during the time recommended for each food. Add boiling water during processing if needed to keep containers covered. Remove jars from canner immediately when processing time is up. *Go to recipe links with safe, proven and tested canning resources. Further Units will cover Pickling and recipies for Various common items that folks like to can and preserve! The main factor in caning is and MUST BE SAFETY! Pleae closely folow all precautions and enyoy the new skills that your will have !